We’re halfway through the 2013 NHL regular season, and the Wild find themselves in the eighth and final playoff spot in the Western Conference. With half the season left, can the Wild hang onto a Playoff berth? Or, will they suffer another late-season swoon that causes them to miss the playoffs for the fifth consecutive season? One way or another the answer to those questions figures to lie in the play of the club’s defensemen and goaltenders down the stretch. With the Wild still struggling to produce consistent offense, their defense has been the major catalyst for their success throughout much of the season. And their defense will be the reason they either make or miss the playoffs, because this club is not going to turn into a goal scoring juggernaut overnight. So, what better time than the season’s mid-way point to hand out grades to the Minnesota Wild’s defensemen and goaltenders. Backstrom, in the final year of his contract, is having a solid season between the pipes for the Wild. Backstrom has started in 19 of the Wild’s 25 games this season, thanks in large part to backup goaltender Josh Harding’s battle with M.S. Despite the larger than expected workload, the Finnish goaltender has shined this year. Backstrom boasts a robust 91.4 save percentage; a svelte 2.29 goals-against-average; and is tied for fifth place in the NHL with 11 wins. With those solid numbers, plus his reliable, and steady every-night-presence in the net make Niklas Backstrom one of the Wild’s team MVPs so far this season. He will have to continue and even improve upon his play in the second half of the season if the Wild are to make the Playoffs this year. Brodin, a 19-year-old rookie from Sweden, has been absolutely phenomenal in the 22-games he has played with the Wild so far this season. He is playing 22-minutes a night, which places him second amongst all rookies in time spent on the ice. His hockey smarts and skating ability are both off the charts for any player, let alone a 19-year-old rookie. The plays he makes in his own zone to get the puck out of danger and up the ice are incredible. This kid has the talent to be a Norris trophy winner once he fills out and gains strength, which is the one aspect of his game that he lacks. But with that said, he such an effective skater and smart player that he rarely puts himself in situations where his opponent can line him up for a big hit. I can not wait to see how good this kid is in five years. 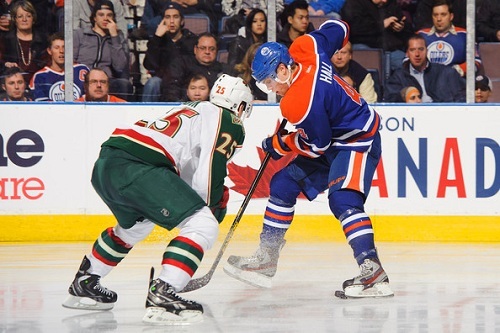 Minnesota Wild star rookie, Jonas Brodin, defends against Taylor Hall of the Edmonton Oilers. Suter’s 27.26 minutes played per-game lead the NHL. His 18 points scored place him in a tie for fifth place amongst all NHL defenseman. And to think- most Wild fans thought he was a bust in the first month of the season. Are you kidding me? Of course the guy was going to have a bad plus/minus- he was/is playing almost 30-minutes a game. So, it’s reasonable to think he might be on the ice for a few goals against. Especially, when the team was struggling a bit early in the season. Now that he is comfortable in his surroundings, he is beginning to produce at almost a point per-game pace. He his undoubtedly the best defenseman the Wild have ever had. And it is not even close. Stoner is having another solid season for the Wild on the back line. He is a plus-2 which leads all of the Wild d-men in the plus/minus category. His style of play is not graceful, but it can be effective. Stoner excels at the defensive aspects of his position. He is sound positionally and an effective poke-checker of the puck. Spurgeon has excelled for the Wild since coming back from a foot injury that cost him eight-games early in the season. His three goals scored are tied for the team’s lead at the defense position. Spurgeon, despite being undersized, has turned into a solid puck-moving defenseman for the Wild. He is solid defensively, while still managing to be apart of the offensive side of the game at the right time. Gilbert’s three goals scored have him tied with the aforementioned Jared Spurgeon for the team’s lead amongst defensmen. Meanwhile, he is a team worst -9 in the plus/minus category. Those two stats kind of sum up his up-and-down play at times this season. A more consistent performance from Gilbert down the the stretch run would be a boon for the Wild’s playoff hopes, as the Wild should expect a little more from its second most experienced defenseman. Falk’s play has been up-and-down this year. And this is not shocking, since he has played that way ever since becoming a member of the Minnesota Wild. At times he looks like he could turn into a solid two-way defenseman; other times he plays like a career minor league. The only thing consistent about Falk; his refusal to use his size night in, night out. Despite that, he has played solid enough in most games that he hasn’t hurt the team’s success single-handily (I’m thinking of you Kyle Brodziak).